While equipped, the wearer can be damaged at most one health per instance. Also, when the wearer loses this card from their equipment area, they regain one health. The Silver Helmet only protects its wearer on a 'per instance' basis. These instances can happen as often as possible however. All the damage will be received one point at a time. It does not matter how the card was lost, but when it is removed the player is immediately healed. Wu Guo Tai can use the armor over and over again in a useful fashion By moving it between her teammates, she can heal one of them each and every turn. I may not sound like much, but over time, it really adds up. This boosts the fighting ability of them long term to the point where they may outlast the other side. The Silver Helmet is a piece of armor with very limited uses while it is equipped. It can protect against Lightning and other things, but there are usually better options. Where the helmet is most useful is when it is lost. Equipping the helmet is just like putting a Peach in the bank for later use. Often people will take advantage of this and try to remove the helmet off someone before they are damaged at all. Also when someone is low on health they will leave the helmet there to avoid giving them back some health. This isn't the most useful piece of equipment, but there are some times when it helps to have it. Most of the time, people equip this so they can take advantage of losing it. 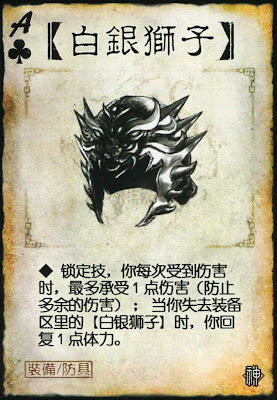 The Silver Helmet probably belonged to Ma Chao in history. Ma Chao was known as 'Ma Chao the Fine' for his brilliant armor and good looks. This armor of course included a lion helmet. While in the service of Zhang Lu, Ma Chao was attacking Liu Bei and came to the pass guarded by Zhang Fei. The two dueled for days, neither able to overpower the other. Zhang Fei was able to relieve Ma Chao of his helmet and take it back to his lines and Ma Chao also made off with Zhang Fei's headband. The fighting greatly impressed Liu Bei, who wanted to win Ma Chao over to his side. Through trickery, Zhuge Liang was able to sever the ties between Zhang Lu and Ma Chao, leaving the latter with nowhere to go and no one to turn to. Liu Bei was then able to win over Ma Chao, and in a great dramatic moment, both generals returned the headgear of their comrade.